Confidentiality. 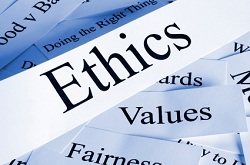 A fundamental aspect of ethical business practice is protecting privacy and confidentiality. In order to provide a safe environment for persons served and customer organizations, no information will be disclosed without a written authorization that specifies what information can be released and to whom. All Consulting and Business Associates Agreements will contain a confidentiality section in accordance with HIPAA and 42 CFR Part 2. Integrity. Services will be provided in a manner that is moral, ethical, consistent, and accurate. Respect. Individual choice and diversity are valued by Behavioral Health Services. Importance is placed on recognition of achievements and efforts. Dependability. Services will be provided promptly and within timeframes mutually agreed upon by the Consultant/Therapist and Customer/Client. Responses to inquiries will generally occur within one business day. Open Communication. Strong, positive relationships are built on a foundation of clear, direct communication. It is the practice of Behavioral Health Resources to provide regular, prompt communication regarding inquiries and the status of services provided. Efficiency. Business practices focus on the identification, reduction, and elimination of suboptimal processes. The focus of tasks will be clear. Time and effort are well used for the intended task or purpose. Communication will be clear, direct, and prompt. Teamwork. Individuals are encouraged to seek ways to improve their performance, take ownership for their work, focus on the strengths of self and others, and provide input for improvement of organizational processes. Excellence. We are committed to honestly and periodically appraising our current performance, seek positive and critical feedback from others, and strive to improve our business practices and operations.